CME: This issue includes 4 AMA PRA Category 1 Credits™; 4 ACEP Category I credits; 4 AAFP Prescribed credits; 4 AOA Category 2 A or 2B CME credits; and 4 ABIM MOC points. 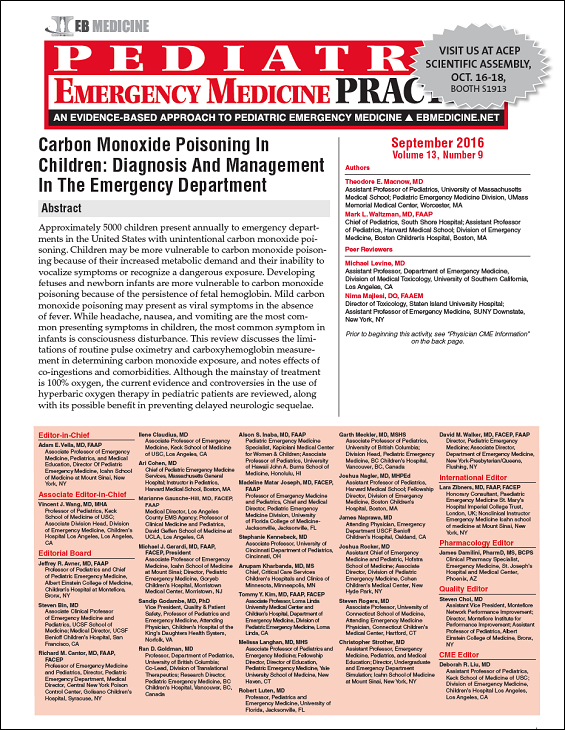 Approximately 5000 children present annually to emergency departments in the United States with unintentional carbon monoxide poisoning. 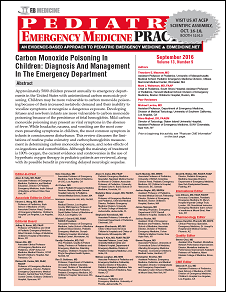 Children may be more vulnerable to carbon monoxide poisoning because of their increased metabolic demand and their inability to vocalize symptoms or recognize a dangerous exposure. Developing fetuses and newborn infants are more vulnerable to carbon monoxide poisoning because of the persistence of fetal hemoglobin. Mild carbon monoxide poisoning may present as viral symptoms in the absence of fever. While headache, nausea, and vomiting are the most common presenting symptoms in children, the most common symptom in infants is consciousness disturbance. This review discusses the limitations of routine pulse oximetry and carboxyhemoglobin measurement in determining carbon monoxide exposure, and notes effects of co-ingestions and comorbidities. Although the mainstay of treatment is 100% oxygen, the current evidence and controversies in the use of hyperbaric oxygen therapy in pediatric patients are reviewed, along with its possible benefit in preventing delayed neurologic sequelae. You receive notification that EMS is bringing in a 14-year-old hockey goalie after a syncopal event. EMS inform you that he is the first of many potential victims en route after multiple players and spectators at a local ice rink began complaining of different symptoms. According to EMS, a noninvasive pulse CO-oximeter reported his COHb level at 21%. His GCS score was 14 at the scene due to confusion and disorientation, his vital signs were stable, and he was given oxygen by nonrebreather face mask. His blood glucose was 115 mg/dL. On arrival, the patient’s vital signs are normal with an oxygen saturation of 100% on 15 L/min of oxygen by nonrebreather face mask. The goalie complains of severe 9/10 frontal headache, nausea, and ringing in his ears. On physical examination, his face is flushed, and he is diaphoretic with an otherwise normal physical examination and mental status. His CBC, electrolytes, and arterial blood gas analysis are in the normal range. His COHb level is 19%. His ECG is normal. As you prepare to manage the patient and other potential victims, you ask yourself: What was the source of this poisoning and are others in danger? What are the most common symptoms of carbon monoxide poisoning in children? What are the treatment goals? What are the indications for consulting with a hyperbaric medicine specialist?